Occasionally an online slot pops up which is difficult to pigeonhole; categorising everything isn’t always the best use of one’s time but slots usually fit into one of several genres. 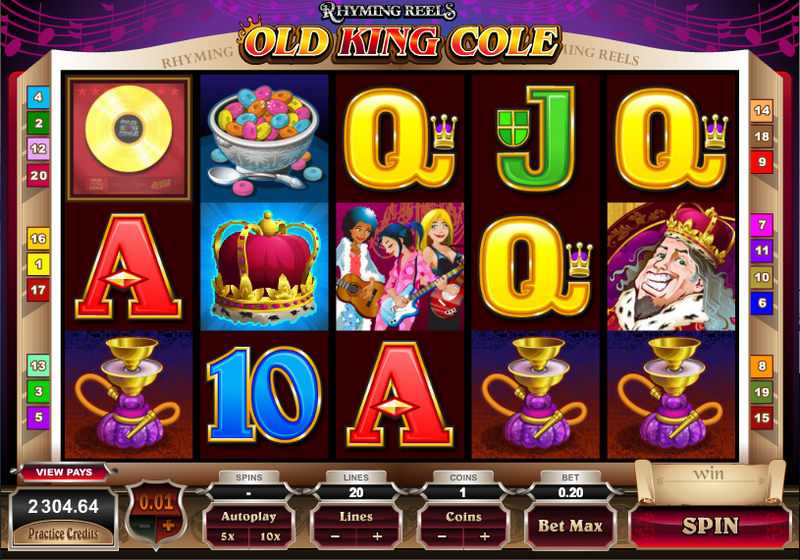 Rhyming Reels Old King Cole from Microgaming is one such game and it ticks several boxes such as nursery rhymes and music. There are several slots in the Rhyming Reels series – check out Jack and Jill for another example. So what’s Old King Cole all about? Well we’re probably all familiar with the nursery rhyme featuring this legendary character and the reels in this twenty payline slot are set against a big open book of rhymes. The more valuable symbols are related to the story in quite a modern way and representing the pipe, the bowl and the three fiddlers are a hookah, a bowl of colourful cereal and a girl band. Bonus symbols include a crown scatter and two wilds – an Old King Cole logo and a gold disc. free spins round which is triggered by landing three, As you can see from the video below there’s a four or five of the crown scatter symbols anywhere on the reels. You’ll get twelve spins plus a random multiplier of up to 7x. During this feature the gold disc and the Old King Cole logo are both wild which provides for some extra winning combos. More spins can be activated by landing three or more crowns again. The gold disc is just a normal symbols in the base game but during the free spins it becomes wild to complement the Old King Cole logo. If you’d like the chance to double up your most recent win just click the ‘Gamble’ button underneath the reels for the opportunity to play a card game. Predict red or black to double your money or the correct suit to quadruple it; get it wrong and you’ll be sent back to the reels with nothing. Old King Cole doesn’t have the same level of humour or overall quality as Jack and Jill but it’s a fun diversion nonetheless. It does have a funky soundtrack and a free spins round so give it a go.